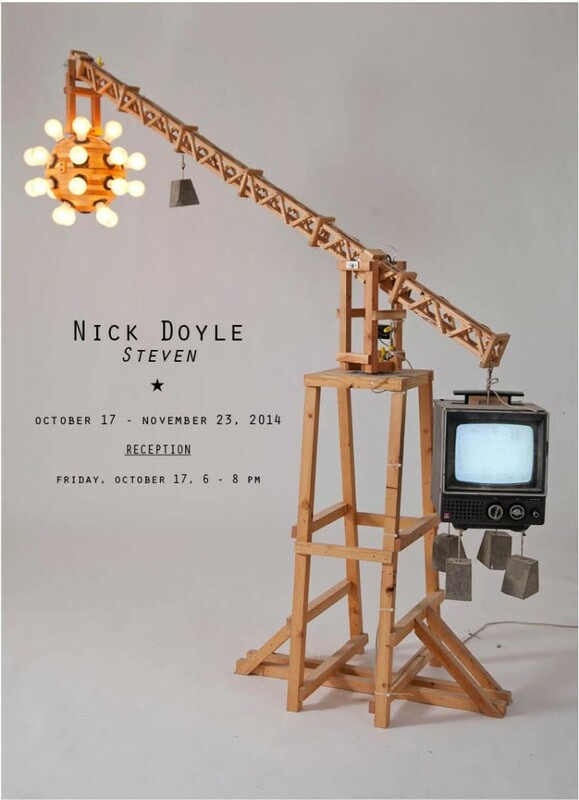 INVISIBLE-EXPORTS is pleased to present, “Steven,” the first solo exhibition of work at the gallery by Nick Doyle. “Steven” is Doyle’s alter-ego, doppelganger, ventriloquist dummy, identity experiment, digital projection, drone clone, Mars rover, and bête noire. The work in which the character appears — and through which he travels — is an elaborate, multi-part, obsessively-assembled diorama-like fantasy-land, patch-worked haphazardly together like a vintage low-budget sci-fi serial, unfolding, in fact, in the familiar, intimidating and distressing present. “Steven” acts out scenes while Doyle directs. But “Steven” is a temperamental star, and is prone to outbursts. 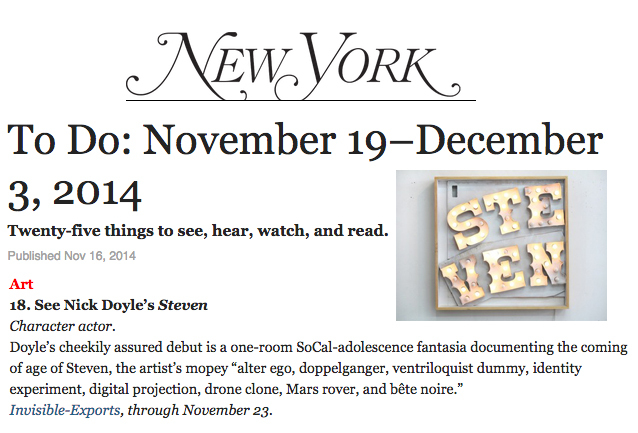 A meticulous, cinematic trompe-l’oeil universe and comic parable-in-parts, “Steven” is also, Doyle says, a deeply personal response to a prolonged romance with apathy — what Doyle calls the “empty and location-less sadness” that forms as “a common reaction to the social stigmatism of ‘culture.’” “If one were to read culture as an expression of humanity, one could not help but feel an overwhelming futility in existence and a sense of reasonless amorality. Apathy often acts as a barrier to insulate and protect the self but the general result is a sense of deep and unrelenting hopelessness.” A fictional travelogue of indeterminate length, scope, and purpose, “Steven” is a pop fantasy of barrier-transgressing, open-eyed exploration, a picture of the way we might traverse the unforgiving world if it could actually cushion our falls. And not just a personal fantasia, but a network of local and cultural mythologies unfolding on both the grandest scale and the most self-mocking, self-undermining — a major new body of work, conceived in startlingly coherent whole. Doyle completed his MFA at Hunter College in December of 2013 and was the recipient of the C12 Emerging Artists Fellowship, nominated by MoMA Curator Laura Hoptman, Artforum senior editor Michelle Kuo, and philanthropist Peter Brant. He recently returned from a residency at Skowhegan. 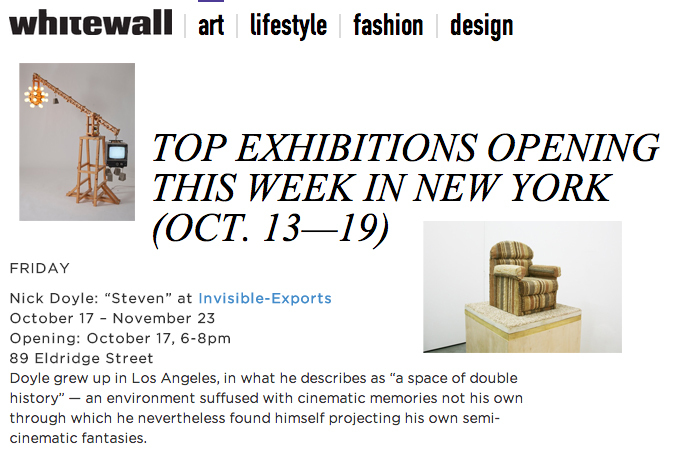 His work has been exhibited at Socrates Sculpture Park, 7Eleven Gallery, among others.